What is the sterilization procedure for women? Does tubal sterilization protect against sexually transmitted diseases? What are the benefits of laparoscopic sterilization? When should sterilization be avoided? What if I decide I want to become pregnant after I have laparoscopic sterilization? Sterilization is a permanent method of birth control. It is the most popular form of birth control worldwide. Tubal sterilization is sterilization for women. In tubal sterilization, the fallopian tubes are cut and tied with special thread, closed shut with bands or clips, sealed with an electric current, or blocked with scar tissue formed by small implants. Tubal sterilization prevents the sperm from reaching the egg. Tubal sterilization can be performed in three different ways: 1) with a mini-laparotomy, 2) with laparoscopy, or 3) with hysteroscopy. Laparoscopic sterilization is highly effective. Depending on how the fallopian tubes are closed, pregnancy rates within 10 years of having the procedure range from 18 out of 1,000 women to 37 out of 1,000 women. Tubal sterilization does not protect against sexually transmitted diseases, including human immunodeficiency virus (HIV) (see How to Prevent Sexually Transmitted Diseases). Women at risk of sexually transmitted diseases should use a male or female condom to protect against these infections. 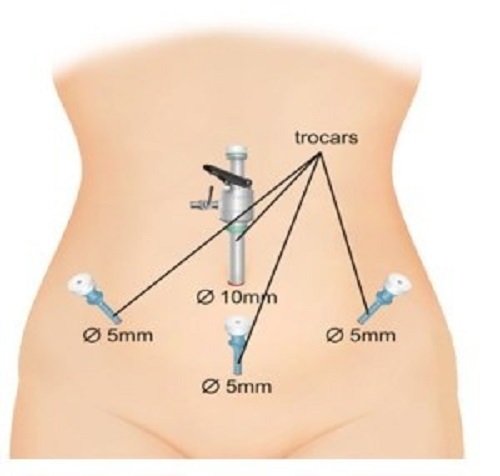 In laparoscopy, an instrument called a laparoscope is inserted through a small incision made in or near the navel. Another small incision may be made for an instrument used to close the fallopian tubes. The fallopian tubes are closed off by bands or clips. They also can be cut and closed with special thread or sealed with an electric current. The laparoscope then is withdrawn. The incisions are closed with stitches or special tape. Sterilization by laparoscopy has a low risk of complications. The most common complications are those related to general anesthesia. There is a risk of injury to the bowel, bladder, or a major blood vessel. If an electric current is used to seal the fallopian tubes, there is a risk of burn injury to the skin or bowel. Other risks include bleeding from the incisions made in the skin and infection. Pregnancy is rare after sterilization. If pregnancy does occur, the risk of an ectopic pregnancy is higher than in women who did not have sterilization. Laparoscopy has some benefits over mini-laparotomy. Recovery usually is quicker. There are fewer complications. It usually is performed as outpatient surgery, meaning that you can go home the same day. It has some benefits over hysteroscopic sterilization as well. Unlike hysteroscopic sterilization, laparoscopic sterilization is effective right away. Most women return to their normal routines within 1 week of surgery. Medical history Sometimes previous surgery, obesity, or other conditions may affect which method can be used. You should avoid making this choice during times of stress (such as during a divorce or after losing a pregnancy). You also should not make this choice under pressure from a partner or others. Research shows that women younger than 30 years are more likely than older women to regret having the procedure. If you choose to have sterilization and you change your mind after the operation, attempts to reverse it may not work. After tubal sterilization is reversed, many women still are not able to get pregnant. Also, the risk of problems, such as ectopic pregnancy, is increased. Tubal Sterilization: A method of female sterilization in which the fallopian tubes are tied, banded, clipped, sealed with electric current, or blocked by scar tissue formed by the insertion of small implants. FAQ035: Designed as an aid to patients, this document sets forth current information and opinions related to women’s health. The information does not dictate an exclusive course of treatment or procedure to be followed and should not be construed as excluding other acceptable methods of practice. Variations, taking into account the needs of the individual patient, resources, and limitations unique to the institution or type of practice, may be appropriate.